This is where we cook. We make a fire on the ground. I collect water when it rains with the yellow container. My name is Faith Wanjiru. I come from Nairutia, Kenya. It is a dry place. Crops can’t grow. We lack water for everything, even to drink. When I was in class 3, in primary school, my father died. We were only left with my mother. We felt as if we had no hope. To me, my life was very hard. Since we were very poor, we could not afford everything that we wanted, like food and shoes and story books. Our family was 9 in number. The little my mum got, she used to pay school fees. But it was not enough. Sometimes, we were sent away from school to go home and get fees. They did not care that we had to walk long distances to return home. We walked hungry. We cried. Most of the time, we went without shoes. At church, children would laugh at us. We ate little food because my Mum had no job. We would stay the whole day without eating. 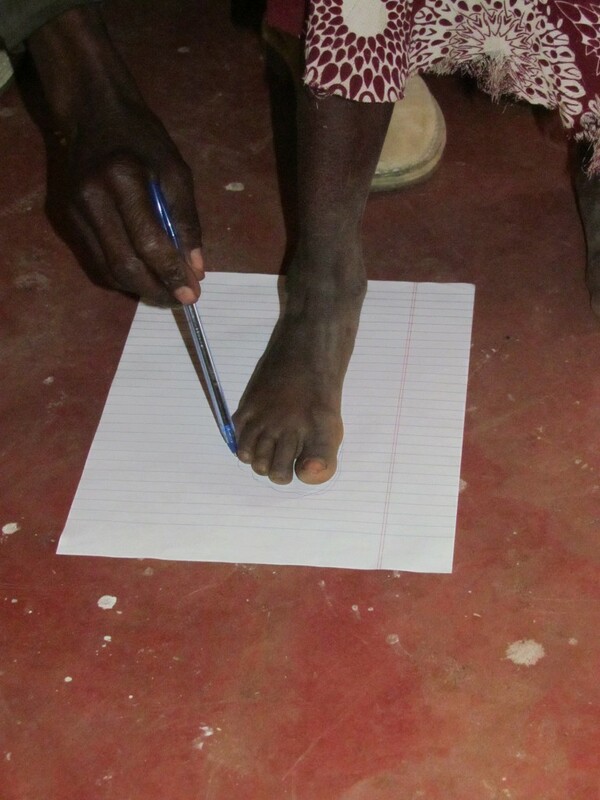 Mr Mugo is tracing my foot so I can get shoes. It is a very exciting day for me! We would work in the shamba (the farm where we tried to grow crops). That made our hands to become rough. I never thought that my life would be better. Our house was made of mud. We would share one bedroom. The house had three small rooms with dirt floors. We would wear tattered clothes. Children born of rich parents would tease and look down upon us. Hunger threatened to suffocate us. Our villagers feasted on all types of food. We would coil into our mud house. As days passed, my family members lost all hope and people thought of nothing concerning our future. We were so humiliated each painful moment we saw other children going to school when we were at home. In the morning, we could hardly afford a cup of sugarless millet porridge. During my first term of class four, we were in the play ground at school. It was a dry field with wild brush and thorns. My mom came running. She could hardly breathe. She was calling our names, “Francis. 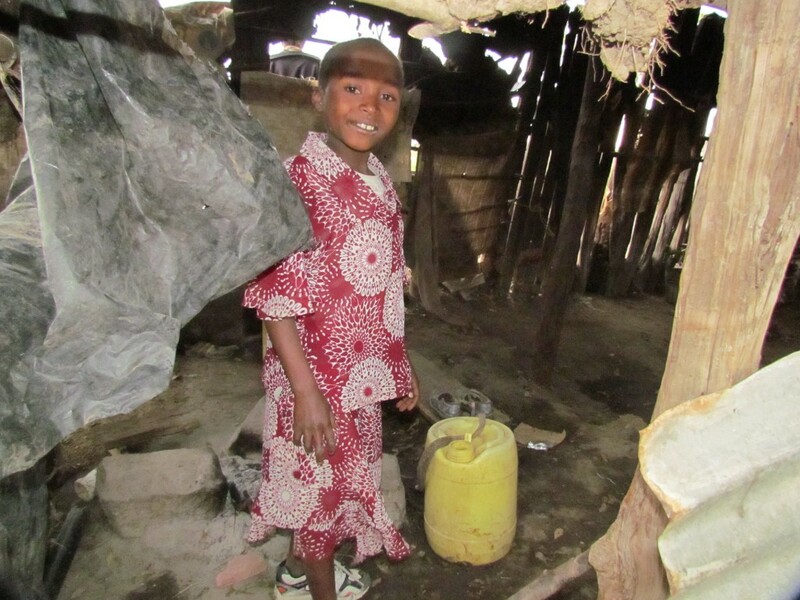 Faith.” We also started running and we followed her for a long distance to Father Maina’s house. Michelle was there with Mr Mugo. I never saw her before. She was a mzungu. I stood with Francis. We were breathing hard and sweating. We always felt ashamed for our bare feet and tattered clothes. Michelle did not mind them. She was kind and loving. She asked me a lot of questions. Her good friends were there too. Here I am with my very own glue and a beautiful school uniform. I could never imagine this was possible! This is when my life changed. I was helped by Matanya’s Hope. I got a sponsor named Lisa. Francis got a sponsor named Tina. We were helped a lot since then! They bought us uniforms and shoes. They took us to a good school. They love us. I really thank God for that. It was like a miracle happened in my life through God’s grace. Thank you Matanya’s Hope for your kindness and your love. Now I am in class 8. I will not let you down. I will learn well so I can become somebody and help others as you have helped me. You have lifted me from nowhere to somewhere. This is me and my best friend Rose. 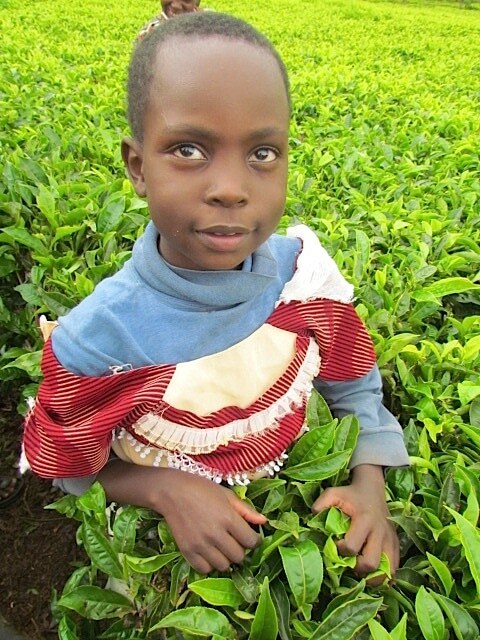 Matanya’s Hope has changed our lives! This entry was posted in The Children on December 31, 2014 by Michelle Stark. 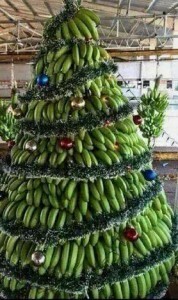 With the influx of social media spreading images of Christmas trees and decor, one Kenyan took it upon himself to create a Christmas tree well suited for his region…. Just like the United States, Kenya shares different climates throughout her land. There is desert and ocean, brush and lush. In a mountain town known as Uruku, dusty roads of hammered rock are surrounded by rolling mountains covered with the emerald green landscapes of tea. From the road, one may witness specs of red and other colors slowly moving through the fields. They are not Christmas lights… they are people, working from sunrise to sunset to pick the tea. But not all of Uruku is steep. The mountains offer just enough flat area for people to build their homes and plant their gardens. It is here where bananas grace the land. May I say: these are some of the most flavorful, sweetest bananas I have ever tasted! And it is here where Douglas Mwenda decided to express his joy for Christmas, using what he had in abundance: Bananas! This entry was posted in Just Life on December 28, 2014 by Michelle Stark. 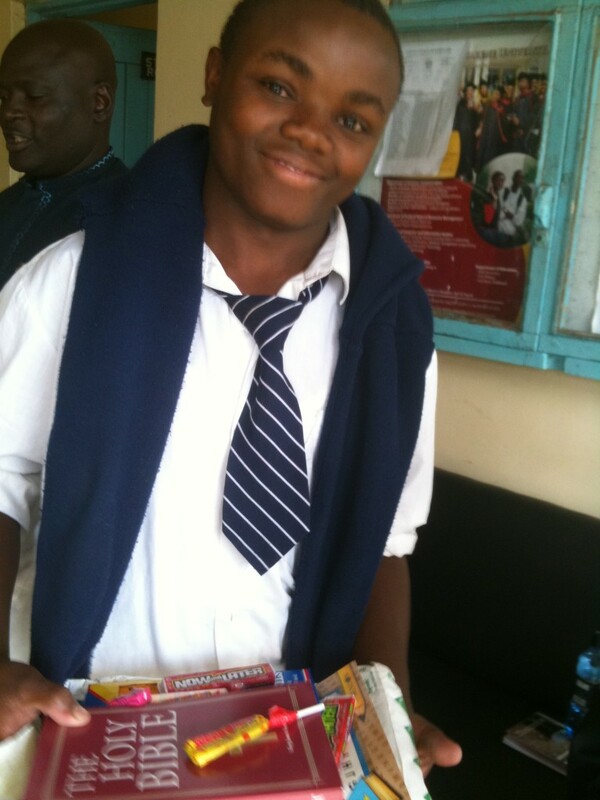 Patrick Muriuki in one of his many school uniforms. Though labeled the smiling boy, Patrick is one of those students who never had it easy. He excelled in his academics throughout primary school and into high school. As a freshman (form 1) he was even promoted to school prefect. This is a very serious role. A prefect takes the responsibility of making sure all other students are in line. They make sure the dorms are well cleaned and students are well behaved. In the USA, this role would be considered an asset. Students could use it on their college and university applications to heighten their appeal to the school intake board. But this is far from the case in Kenya. Though an esteemed role, the students often dislike the prefect (if the prefect is doing their job). And it’s not fun and games with school management either. When something goes wrong in the school, not only do the students responsible suffer, but the prefect suffers as well. The school often believes that it was because of poor management on the prefect’s part that the offense occurred. And so begins Patrick’s academic battle. As a freshman, Patrick agreed to attend a school in a remote region far from home. The school lacked water and was populated by members of a foreign tribe. In his time there, Patrick came to love the tribe, forging unique and wonderful friendships. He was quickly voted prefect… and trouble knocked the door to his perfect world down in a thunderous crash! …along with Patrick, our A student and class prefect. He was shocked. “How can this be happening to me?”, he asked me repeatedly, his voice hardly audible. “Surely there is no hope for me to go on.” But with reassurance, we built this incredible guy back up and found him a new school. Problem? Once you wear the “expelled” label in Kenya, you might as well be marked forever. Patrick did all he could to rise above the challenges. He knew he had to keep clean: VERY CLEAN. Though the curriculum was ahead of his old school, he worked hard… staying awake late and waking earlier than anyone else so he could study. He caught up with the class and was soon back to achieving the “A”s he was used to. Patrick was admired and voted class prefect. He could not believe how good it felt to be appreciated for his integrity and hard work. Life was getting better. Within a few months, Patrick was further encouraged for his role as a model student and his academic excellence. He was warded a field trip. And just when life felt as sweet as the juice from a pomegranate, darkness struck. Students misbehaved. His heard sank lower than before. No one wanted to hear anything. With two expulsions, it would be hard if not impossible to find another school. We went to everyone we knew and told them this remarkable student’s story. We got a lot of “no’s” but we got a “yes”! A miracle occurred. Patrick was accepted to his THIRD school in a very short time period. This was a mixed boarding school and he was used to being with all boys. He did not want to go, but, grateful for the chance to be educated, he was fitted for his new uniforms and a new journey began. Patrick’s academic excellence elevated him to the top of the class almost instantly. Teachers applauded him for his work and soon, they saw the integrity in this model student. He was appointed class prefect. A group from another boy’s boarding school broke into Patrick’s school while others were in class. They tried to set fire to the boys dorm. Who got expelled? Patrick. You don’t even have to ask anymore, right? I was in Kenya at the time this happened. I have to say, it was getting hard to believe that this kid was as good as I believed he was.. I mean, how could this keep happening? We felt as if we were running out of network – but God is never short of resources! We had to get to work immediately so that we could help this young man on his journey ahead. Schools closed their doors. But one boarding school of average performance agreed to take Patrick in. We knew a teacher at the school who promised to keep a close watch on him for us. Patrick assured us, “I will stay focused on my studies this time.”. Finally, a year passed. Time neared for the end of high school exams: KCSE. (Here it is our SAT’S) Patrick was shocked to learn that he did not perform as expected. His heart sank. Universities give scholarships to A to B+ students and he missed the mark. All of the weight for University acceptance rests solely on the KCSE scores. We talked to Patrick and after much deliberation, suggested that he repeat his final year in high school at – yes – yet one more school. He almost could not stomach the thought… but after careful prayer and consideration, he released the control he was trying to foster on his own life. “I know what I want and the only place to get that is through education.” he told me. “I will go.” So Patrick spent this last year repeating his final year of high school. Again. But what Patrick got out of school was far more than his academic excellence. Patrick was molded into a man. He was brought low and hard and to his knees. He was stripped of his ego and served heavy doses of humility. And he pressed on. The smiling boy won… Though today he is a smiling man. I received this message from Patrick today. 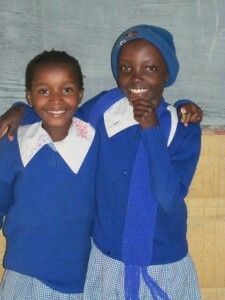 Matanya’s Hope is proud to be walking on this earth with Patrick. We are honored to stand by his side. To his sponsors, we salute you – for we could not carry this torch on our own. To Don and Karen, thank you much! To Patrick, you just keep going. God is not done with you yet – but what He is doing in you is breath taking, simply breath taking! I am so excited for you to begin University Patrick! This entry was posted in The Children on December 23, 2014 by Michelle Stark. Anita picks tea on a neighbor’s farm. She must carefully select the top 3 tea leaves from each matured branch. This work helps send her to school. Anita’s mother loves her, but she is rarely home to give her daughter that reassurance she needs. When Anita and her sister Winnie recounted their story to me, tears streaked little Anita’s face. “Our mother works four hours away” Winnie told me, “in (the over crowded city of) Nairobi. Her job is cleaning public toilets.” All I can say is, these public toilets make most of our public washrooms look – and smell – good (if not great)! The city of Nairobi routinely faces a shortage of water. When this happens, washrooms become collection tanks for waste: waste that is not always carried away. My heart bleeds for Anita’s mother. I keep thinking about the risk of disease in these dirty surroundings and I pray that she will be able to do her job and stay unaffected by the conditions she works in. She seems so brave; forsaking her own comforts in an effort to do everything to help her children. I don’t know if she even earns the equivalent of $1 a day, but she is doing all she can to help her children. Anita’s father left years ago. He pours his earnings into illicit brew and shows no care for his children. He doesn’t offer a coin for their welfare or education. When Winifred speaks of him, she shutters at the thought and quietly surrenders to the all too common hurt by bowing her head in remorse. Tears come – again. How many times will these children have to cry? How many nights will they sleep with a longing for a hug from mom and dad? Anita washes clothing in order to help her grandmother. 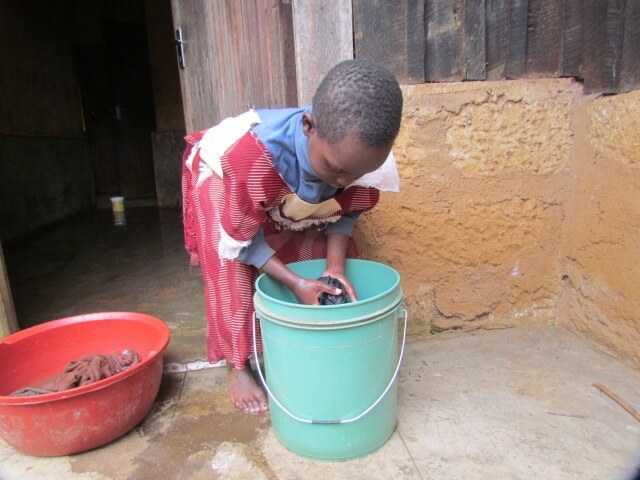 Today, she is washing her school uniform in preparation for her return to school. “We thank God for all you have done to help Winifred”, Anita’s grandfather tells me during this intimate visit. He bends over and carefully places 10 eggs into a small, clear plastic bag. Oh my gosh! “I can’t do this“, I think; “I know what he is going to do.” My heart is aching at the thought. I know I can’t say a thing. He also must feel that he can give. I try to hide my own pain. I thank him for having such a kind heart. I know all too well that in Kenya, it is frequently the case that children left behind by misfortune are often left to face life on their own. Children are left to care for children. In Anita’s case, I know one thing for sure. She and her sisters are loved. 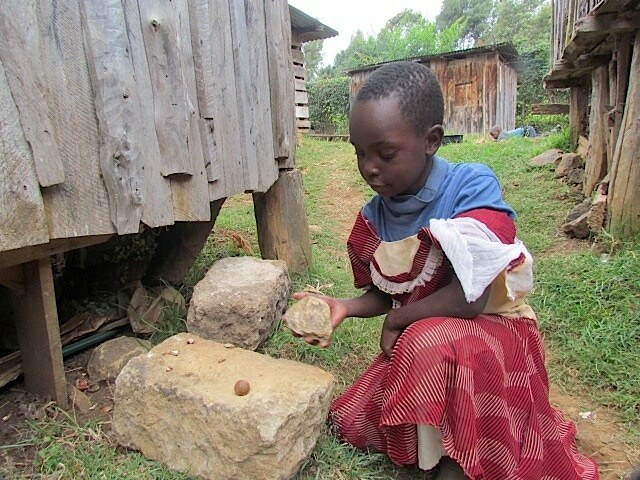 Anita shows me how she cracks macadamia nuts from her grandparent’s farm – using a large stone as the base and a smaller one as the cracking tool. As I watched her chew the nut, I was filled with joy. She was getting some great nutrition! The mission ended but Anita’s case was far from over. Just weeks after our return to the USA, Matanya’s Hope held our first golf outing. Anita was sponsored! 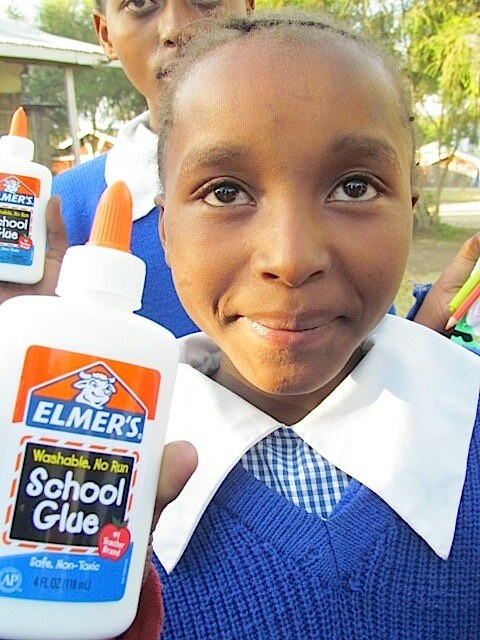 She will now be able to go to school, fully uniformed and equipped with books, supplies and 3 hot meals every day! Through this kind act, Anita was given the gift of hope. And that, in a nut shell, is what it takes – hearing a story like Anita’s and doing something to change it. For stories about more children who need sponsorship, please go to our website: www.matanyashope.org or feel free to call us at 708-822-HOPE (4673). This entry was posted in Uncategorized on December 12, 2014 by Michelle Stark.